“Regarding the opinions of Luca Cerizza, at p.8 of “Le Mappe di Alighiero Boetti” [Mondadori Electa S.p.A. Milano 2009 – first published in English as “Alighiero e Boetti: Mappa” Afterall Books, London, 2008] he affirms that nobody before Boetti thought to show us a world like a mosaic tangled with political formations, a puzzle of color and symbols, a muddle of differences…etc. Moreover Cerizza knew very well my above mentioned exhibition and catalogue [yet], [evidently a] very ill-mannered person, he published at p. 76 of his controversial “Le Mappe di Alighiero Boetti” a geographical carpet belonging to my collection and for the first time published at p.129 of my catalogue, without mentioning my name [or the] origin of the carpet. There are at least two reasons to contradict this wrong statement: first, geographical carpets are centuries older than the maps of Boetti. They were done mainly for the mighty, while in Boetti’s time [it is] for the art market; second, you will never see in Boetti maps, ordered from Afghan weavers [embroiderers], such a variety of shapes and forms as you find in the geographical carpet, with or without flags, where colorful nation’s shape is respected, or where forms become sometimes abstract, like cells, as you can see in my catalogue “Afghanistan Tappeti di Guerra Tappeti del Mondo” 2001, Contemporanea Arti e Culture, from pp. 119 to 133. 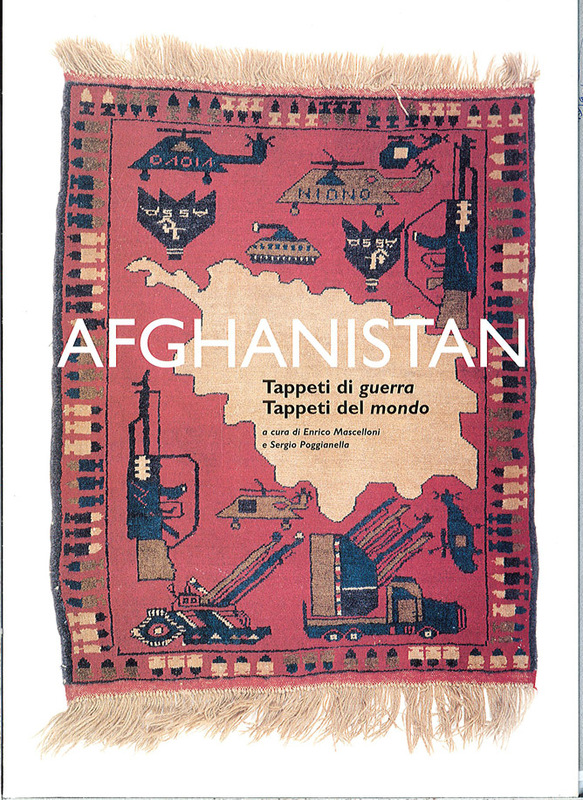 It would be also very interesting, from the conceptual point of view, to study the artifacts, signed by Boetti and the artifacts conceived by the afghan weavers, from an anthropological perspective. Traditional art, when invested by aura, can shift into the contemporary art system, as Boetti, in a masterly manner did, deciding to accept the result of the woven maps, even ordered following a model provided by him, without any other change, any other intervention. We all have an idea of what we mean when we refer to an artist: we think about his [her] ability, inventive capability, aesthetic awareness, inspiration, creative gesture, etc. This can be applied in the artistic environment of any culture, including the afghan weavers’ art, as the art of war or geographical carpets, but only if rules and conventions are [recognized] by the contemporary western art system and art market. The geographical carpets are the creative products of the afghan weavers; artifacts that in different contexts can be considered traditional art (for example in an ethnographic museum, or among ethnic art dealers) or, with the aura acquired in a modern or contemporary art museum or gallery, changing, like a chrysalis into a butterfly, they can become works of art. In this new context, these objects should belong to contemporary art or to material culture? Should the war and geographical carpet weavers [be regarded as] artisans or artists? It is the power of the diverse cultures, which determines the symbolic, social and economic value of an artifact or of a work of art. Editor’s note: an anthropological theory of art might argue that the reason the map of Afghanistan is mirror-reversed in the image above is that it is easier to copy a carpet from the reverse-side. But it also tells us something significant about visual literacy and the makers’ familiarity (or otherwise) of the emblem of the map of Afghanistan. This entry was posted on October 17, 2011 at 12:25 am and is filed under In Perspective, Maps in War Rugs. You can follow any responses to this entry through the RSS 2.0 feed. You can leave a response, or trackback from your own site.